The dust jacket for the first impression, 1960 edition, published by the University of Chicago Press. Every time I see it, I think: “Purple. Lots and lots of purple.” Well, it was the ‘60s. The world of Sherlock Holmes was a busy one in early 1960. On the big screen (especially at drive ins), Peter Cushing and Andre Morell were still racing after “The Hound of the Baskervilles,” even though their film had been released in the summer of 1959. On television, the “Sherlock Holmes” series featuring Ronald Howard was in syndication, popping up at 4 in the afternoon or 11.30 at night, depending on the whims of your local station. Speaking of whims, Adrian Conan Doyle, Sir Arthur’s less-talented son, had sold an extended piece about his father to King Features Syndicate. Appearing in Sunday newspapers around the country, Adrian made the case for his father as the one and only model for Sherlock Holmes. So perhaps it should have been no surprise when a Sherlockian classic from the 1930s was revived for a new generation of readers. The Private Life of Sherlock Holmes got a new incarnation on May 3, 1960. A review copy card that establishes the exact publication date: May 3, 1960. A rare copy of the University of Chicago’s press release announcing the new edition of The Private Life of Sherlock Holmes. By the 1960s, the original 1933 edition of Private Life was a collector’s item, as Starrett himself noted while on a Chicago television show in 1964. Many of the topics Starrett covered in that edition had evolved in the intervening 27 years. For example, readers in the early 1930s thought William Gillette was the definitive Holmes. Now, in 1960, Basil Rathbone’s numerous films and radio shows made him the voice and face of Holmes for the current American generation. But Rathbone wasn’t alone. The aforementioned Howard and Cushing had made their own contributions to the role, as did Sir John Gielgud and Sir Ralph Richardson during their British radio broadcasts in the 1950s. More importantly, the universe of Sherlockian commentary had undergone an explosion in those 27 years. While there were isolated theories published in magazines and newspapers before 1933, the “organized” Holmes world now consisted of a couple of major journals, numerous smaller publications and a few healthy shelves full of books from both sides of the Atlantic. Revelations and observations made by Starrett in 1933 now seemed tame and old-fashioned. A simple reprint of the 1933 edition might be interesting, but would it sell to Sherlockians (and others) whose pop culture reference points were nearly three decades advanced? Starrett decided the book needed a major rewrite. We’ll detail the changes soon. But first, let’s look at the book. The University of Chicago Press, Chicago, IL, 1960. First Edition. Hardcover. 8 3/4" X 6". viii, 156pp. Cover: Illustrated cloth over boards. Quarter red cover with a reversed image of Holmes from D. H. Friston’s drawing, looking like a bad X-ray. Spine: THE PRIVATE/LIFE OF/SHERLOCK/HOLMES/STARRETT/CHICAGO stamped in gold on a red cloth spine. Title Page: D.H. Friston’s image of Holmes. 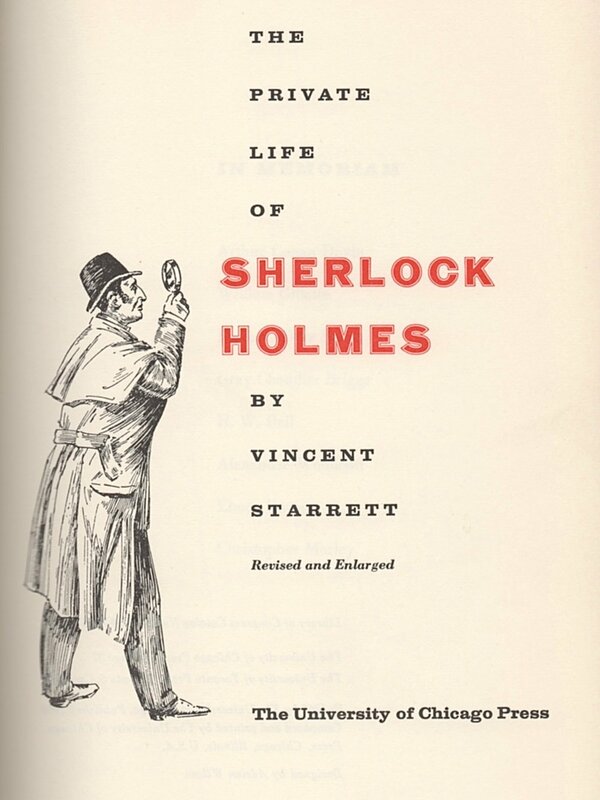 The Private Life of Sherlock Holmes by Vincent Starrett. Revised and Enlarged. The University of Chicago Press. Dust Jacket: THE PRIVATE LIFE/OF SHERLOCK HOLMES at top of cover on violet field; VINCENT STARRETT at bottom on a white field. In between: “a unique/’biography’ — revised/and enlarged.” A silhouette of Holmes in deerstalker and pipe at left on a blue field. drawn by Elmer Jacobs. Spine: STARRETT at head. THE PRIVATE LIFE OF SHERLOCK HOLMES. CHICAGO at tail. 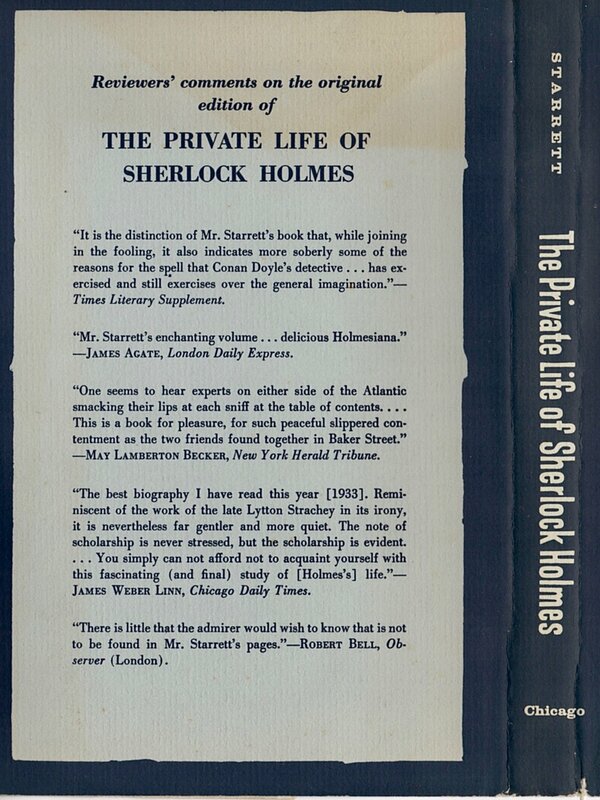 Back cover: “Reviewer’s comments on the original/edition of/The Private Life of Sherlock Holmes.” Followed by five blurbs and “The University of Chicago Press,” at bottom. Front inside flap: Blurb describing the book, continued on back flap. Back inside flap: Continued blurb with a brief “About the author” bio. Main description identical to first edition, including the title page which retains the “revised and enlarged” language. Dust Jacket: THE PRIVATE LIFE/OF SHERLOCK HOLMES/VINCENT STARRETT on light grey field. Holmes bust silhouette in profile. Artist not identified. Back cover: Same blurbs as on the first, but without “The University of Chicago Press” at the bottom. Copy on flaps is identical. You’ll notice the publisher is the University of Chicago Press. While a highly respected academic press, Starrett had hoped to have a mainstream publisher like Macmillan (who published the 1933 edition) or Knopf put out the book. For whatever reason, that didn’t happen. 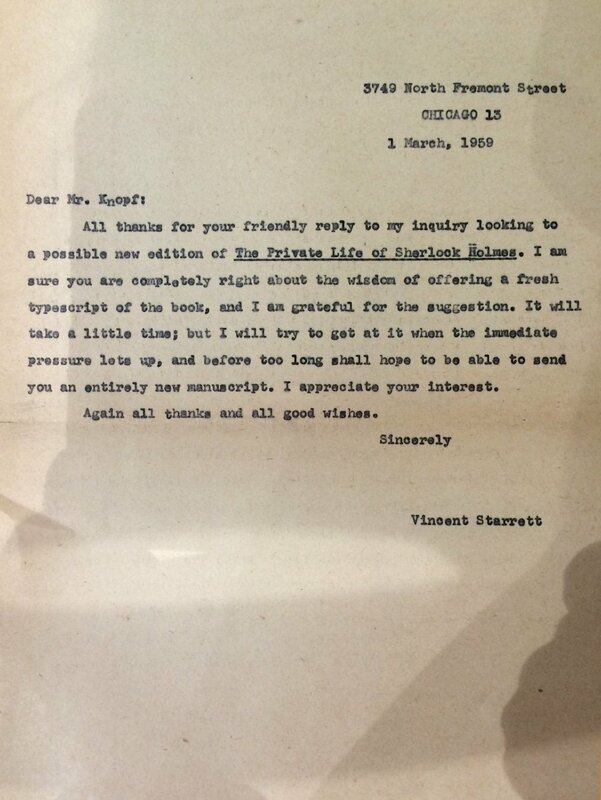 The accompanying correspondence between Knopf and Starrett is from a private collector who has generously allowed them to be seen here for the first time. As you can tell, Starrett wanted to “correct” the original book, but Knopf pushed back, urging him to create a new manuscript. That manuscript is owned by the University of Minnesota. The eventual publisher, The University of Chicago, promoted the book as best they could, but the fact is their advertising budget could not match that of one of the big houses. The 1933 edition had carried a dedication page, “To William Gillette, Frederic Dorr Stelle, and Gray Chandler Briggs, in gratitude.” Now all three of those men, plus several others, had passed away. The “In Memoriam” page must have been especially difficult for Starrett to list. He had been friends with everyone on that list except Arthur Conan Doyle, although he had interviewed Doyle once during an American tour. Gillette WAS Sherlock Holmes for generations of readers and theater goers. Steele’s artwork created the image many in the United States recognized immediately as the master detective. Briggs did the footwork in identifying the “real” location of 221B Baker Street. Bell had become an international acquaintance, whose anthology on Holmes was as well known in England as Private Life was in the U.S. Woolcott, bless his egotistical heart, accompanied Starrett to his one and only BSI dinner. Davis wrote an extended review of the first edition of Private Life, not to mention the BSI’s Constitution and Buy-Laws. And Morley was his brother in Holmes worship. Now, they were all gone. Starrett’s generation among the Sherlockians was fading. A comparison of chapters in the two editions. The University of Chicago press release and the first dust jacket promote the book as being “revised and enlarged.” It had certainly been revised, but the fact is the 1960 version was smaller than its older brother, by almost 60 pages. Few seemed to notice. In fact, some reviewers picked up on “enlarged” language, either out of laziness or ignorance or a desire to boost Starrett’s sales. Among other major losses, Starrett had eliminated the two “examination papers” and his bibliography that graced the earlier edition. “The Singular Adventures of Martha Hudson” helped solidify a bit of Sherlockian dogma that continues to this day: the notion that Mrs. Hudson and Martha from “His Last Bow” are the same person. Starrett states it as fact, without explanation. But as others, including Catherine Cooke in The Baker Street Journal, have pointed out, that simply can’t be true. “The Singular Adventures of Martha Hudson,” by the way, had a long publication history before the 1960 edition of Private Life. The essay was included in the 1934 anthology, Baker Street Studies edited by H.W. Bell; Edgar W. Smith’s Profile by Gaslight in 1944; and in Starrett’s own anthology, Bookman’s Holiday in 1942. Reading it again I can’t help but believe it was written at the same time the rest of the 1933 edition of Private Life was written. It has the same feel as those earlier essays. If that feeling is true, why didn’t he use it in the 1933 edition? By 1960, the original printing of Starrett’s pastiche, original copies of “The Adventure of the Unique Hamlet,” had become expensive collector’s items. Originally published in 1920 as a holiday treat for fellow book collectors, Starrett himself had a hard time putting his hands on copies. 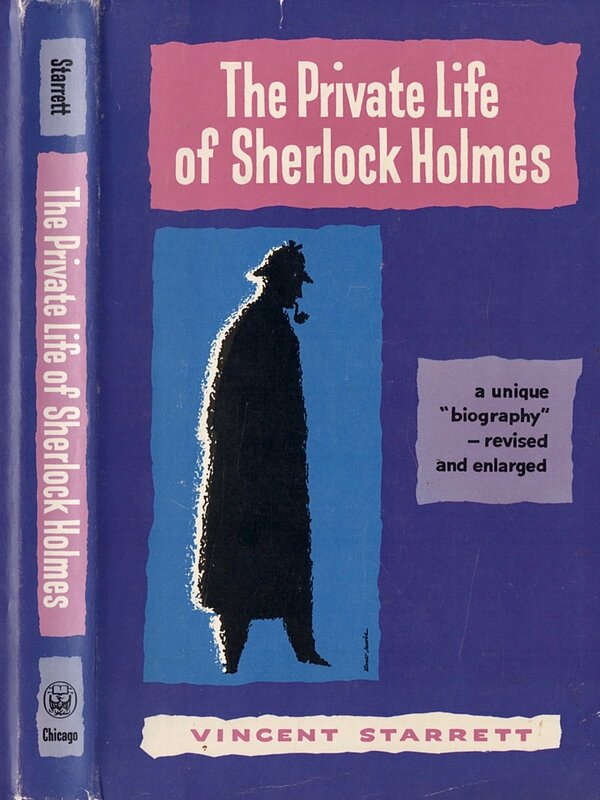 Publishing it in Private Life combined two of his three great contributions to the Holmes world. The one item he should have included, but didn’t, was his sonnet, “221B.” While considered a classic today, in 1960, it was a local favorite of the Chicago scions. The sonnet would not gain greater popularity until the John Bennett Shaw conferences of the 1980s and ‘90s. 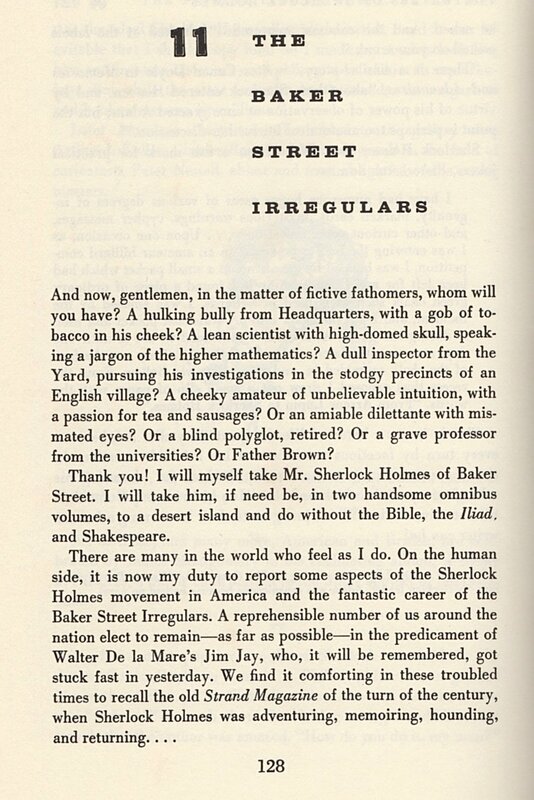 The opening page of Starrett’s chapter on the Baker Street Irregulars of New York. The essay on The Baker Street Irregulars is a curious one. Starrett only attended the 1934 dinner, so his sense of the group was well behind the times in 1960. The BSI had grown considerably in the intervening years and dinners were now a large and less informal affair. Having said that, Starrett writes lovingly about the Irregulars and their antics. I will always have a soft spot in my heart for his BSI essay, because it was the first time I read about the Irregulars, and its Constitution and Buy-Laws. Starrett made New York City feel like a literary fairy land, with an annual Algonquin table-like gathering where wits from around the country gathered to show off their skills at amusing others. To a geeky high school kid standing in the stacks of the McKeesport, Pa., public library, it might as well have been held on Olympus. Next Time: Will the critics be kind?